NS coastline is 7933 kilometers, includes the mainland and Cape Breton. Coastal Islands only have a total coastline of 3,111 Kilometers so, the total coastline of mainland Nova Scotia, Cape Breton and all the little Islands in the ocean that are a part of NS is 11,044 kilometres. At 176 metres in elevation Botany Bay Lake, Pictou County drains west into the Salmon River Shed as well as east into the West River of Pictou Watershed. Nova Scotians now have free, easy access to a wealth of government data via Nova Scotia Government’s Open Data Portal. The new portal offers more than 130 government data collections that are available to be used and shared by the public. To learn more read the Release. Congratulations to Paul Illsley, Nova Scotia cartographer, on his newly released interactive online map ExploreNS.ca, showcasing 650 sightseeing locations in Nova Scotia. ExploreNS.ca is a great example of the use of location-based information to create a thematic map of Nova Scotia. Provincially-owned land in Nova Scotia has many demands on it and we must manage this asset sustainably and efficiently. Sustainable land management requires accurate, integrated and easily accessible information that can be used to make better decisions. This allows the Province to use provincially-owned land for public benefit, protect it for future generations and emphasize the values of good stewardship. Did you know that Geomatics Atlantic 2015 is PART of the 9th Symposium of the International Society for a Digital Earth (ISDE) in Halifax on October 5-9, 2015? Geomatics Association of Nova Scotia and Canadian Institute of Geomatics (Atlantic Branch) are both offering their members a discount of $220 on early bird registration fees! Dr. Jason Bond received the first ever GANS Award of Distinction at the Annual General Meeting of the Geomatics Association of Nova Scotia on June 9, 2015 in Halifax. This award is presented annually to an individual or an organization that has made an extraordinary contribution to the geomatics sector in Nova Scotia. 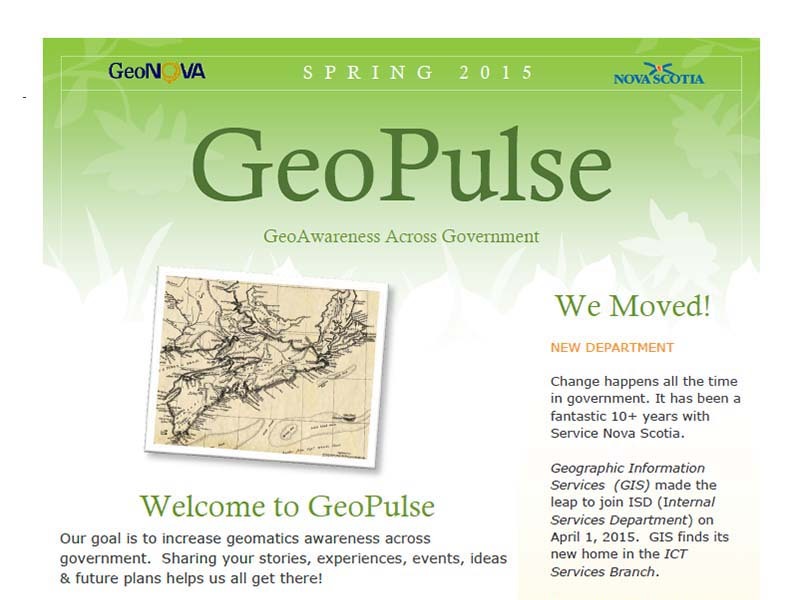 GeoPulse launch is raising geoawareness in government. Everyone uses geographic information every day – and they might not even know it. Geographic information provides the foundation behind so many tools that help you discover where you are in the world – and we want to increase that geoawareness across government. Congratulations to GIS Specialist, John MacKinnon, whose submission to ESRI Canada’s 2015 Maps and Apps Calendar Contest was selected as one of the 12 shortlist entries from over 60 submissions received. His submission was also one of nine finalists. ESRI is a privately held, Canadian-owned company that provides world-class enterprise geographic information system (GIS) solutions, so this is quite an accomplishment and honour for both John and GIS. John’s map submission is featured in ESRI’s 2015 Calendar, which is sent to over 9,000 GIS professionals across the country. Location based information just got smarter. Active control stations are collecting better positions than ever before. That foundation will help to create better mapping and better decisions. A two year GPS Spatial Referencing System project has been approved for funding in the provincial capital plan for 2015/16. Led by Geographic Information Services, the Nova Scotia Spatial Referencing Viewer will be updated with modern GPS-enabled survey monuments that will provide complete province-wide coverage.